I’m under-selling this recipe by describing it simply by its ingredients and method of cooking, but I can’t really call it “eat with a spoon pork dish that will warm you from the inside out”, can I? It is however the perfect antidote to Storm Rachel. I first made a variation of meat cooked in an apple sauce when I was 14. We had a French Appreciation Day in school and I volunteered to cook a dish to serve to students and staff. After doing some research, I decided to cook Poulet A La Normande which meant I got to raid the drinks cabinet for calvados and use cider in the sauce as well. The original recipe is quite complicated, so I’ve simplified how I cook this dish to reflect the great ingredients we have grown, prepared, and raised. The onions and garlic came from our allotment, as did herbs I use to dress the sauce. Apples from a friend’s local garden; I made them into a simple sauce when they were picked, then froze it. Cider came from our first batch that we made before Christmas. Potatoes are the only item we didn’t grow that features on the plate, but they come from a local farmer who trades spuds for our free range pork. We have spent an awful lot of time planning our allotment for the year ahead. As I type I’m awaiting delivery of some bare-root trees, yesterday himself started to build a number of new raised beds at the allotment. I’ve been laying out the allotment on a big spreadsheet so that we can figure out what’s going where and planning the tasks each month. What if you don’t have pork cheeks? They’re pretty hard to procure in Ireland unless you order from a butcher in advance. Normally sold straight from slaughterhouse to Asia, if you can’t get pork cheeks then use pork chunks or chops and they will taste just fine. This is not the prettiest of dishes but you will be sorry when you reach the bottom of the bowl! Make sure your slow cooker is turned off at the start. Put the cider, onions, apples, garlic and Worchestershire sauce into the slow cooker. Stir well so that all the ingredients inside are coated by the cider. This will prevent the apple chunks from browning. Put the lid on and turn the slow cooker on high. Put the plain flour and seasonings (paprika, salt and pepper) onto a plate and combine together. Heat a non-stick frying pan on medium. Once it has reached heat. Dust the pork cheeks with the flour mixture by patting each side onto the plate. Fry the pork cheeks on the frying pan in batches of 4 until they are golden on each side. Once golden pop them straight into the slow cooker. When all the pork cheeks are in the slow cooker; give it a final stir to make sure everything is coated with the liquid. Cook on high for 4 hours. 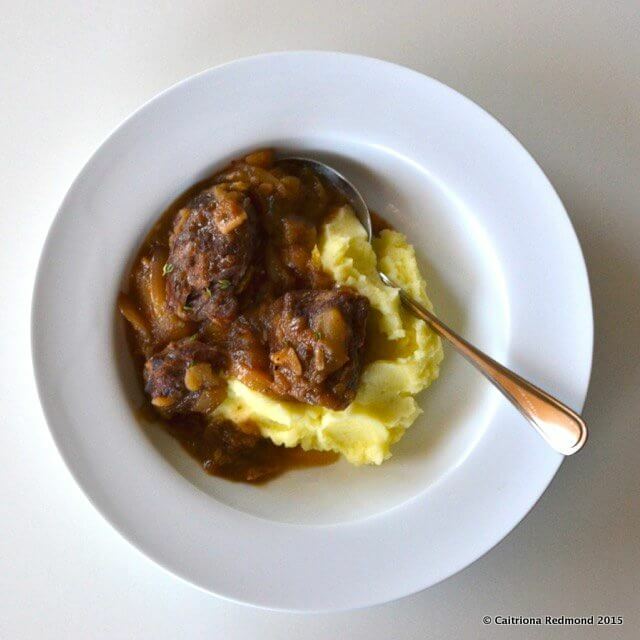 Serve with mashed potato, or if you’re feeling decadent try my recipe for garlic mash. Note I don’t season this dish very much as the sauce contains strong flavours. Feel free to season it more but we prefer not to use too much salt. Note you will need to ensure you have a secure lid for the top of the dish. This method uses both the oven and the hob. Place a large, heavy bottomed casserole dish on top of the hob. Put the cider, onions, apples, garlic and Worchestershire sauce into the dish. Stir well so that all the ingredients inside are coated by the cider. This will prevent the apple chunks from browning. Turn the hob on medium. Put the plain flour and seasonings (paprika, salt and pepper) onto a plate and combine together. Heat a non-stick frying pan on medium. Once it has reached heat. Dust the pork cheeks with the flour mixture by patting each side onto the plate. Fry the pork cheeks on the frying pan in batches of 4 until they are golden on each side. Once golden pop them straight into the casserole dish. When all the pork cheeks are in the dish; give it a final stir to make sure everything is coated with the liquid and bring to a simmer on the hob. Turn your oven to 150 degrees Celsius. Once the oven has reached temperature, put the lid back onto the dish carefully transfer the dish into the oven. Cook in the oven for 3hrs, 30 mins. Serve with mash as detailed above. I’m hungry for pork and apples now, and it’s only 9:30 AM here! Looks like a good recipe.